Jim Burns is an outdoor writer/photographer based in Scottsdale, Arizona. He graduated from the University of Kansas with a degree in English Literature and became hooked on birding while backpacking with his wife, Deva, trying to place proper labels on the birds they were seeing along the trail. 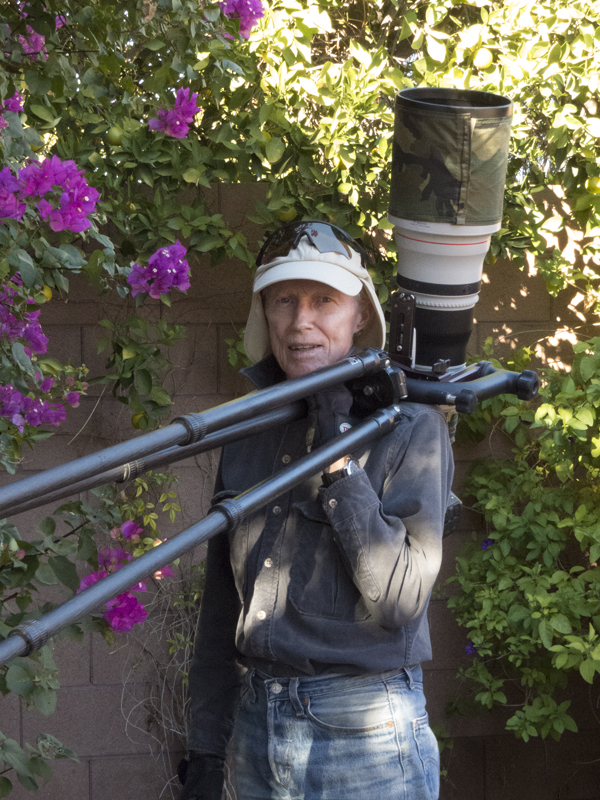 He has been photographing birds and other wildlife for 30 years and for ten years wrote photo quizzes for the Cactus Wrendition, the publication of the Maricopa Audubon Society in Phoenix. He currently writes a birding column, "Bird Is A Verb," which for four years appeared on the Environmental Page of the Arizona Republic, the metro Phoenix daily newspaper, every other Thursday. When the Republic downsized several years ago, "Bird is a Verb" migrated to its permanent home on this website. Jim’s articles and photographs have been published in Birding, Birder's World, BirdWatching, Bird Watcher's Digest, Outdoor Photographer, Argia, and Valley Nature, and he has written four books illustrated with his photography: A Beginner's Field Guide to Phoenix Birds, published by the Maricopa Audubon Society in 2004; North American Owls--Journey Through a Shadowed World, published by Willow Creek Press in 2004; Jim Burns' Arizona Birds, published by the University of Arizona Press in 2008; and Owls Rock, an e-book published by Kindle and Nook Books in 2012. Most recently he and Matthew Studebaker have collaborated on the Arizona Bird Photography Site Guide available at Studebaker Studios.